Someone said that if the city has his life, these old buildings are his memory. Xuhui District has more than 2000 buildings of historical interest and cultural importance, most of which are the classics of half a century ago. The protection of these old buildings means not only maintaining them but also discovering their great humanity and social value. With the help of the Committee Office of Xuhui District Historical and Cultural Area and Excellent Historical Architectural Protection, the Committee of Shanghai Artist Association and Shanghai Xufang(Group) Co. Ltd., it is a new way and it is a good solution to preserve these old buildings by recreating their aesthetic value. 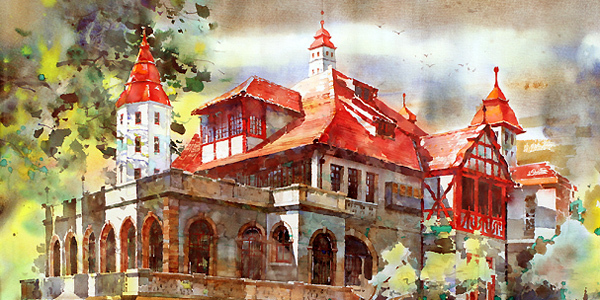 As a result of this, Xuhui District Historical Architectural Watercolor Painting Show is being held. 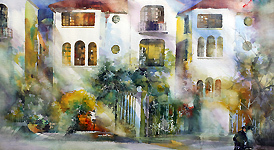 The combination of the beauty of architecture and watercolor painting is on display in this show. 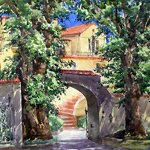 In order to capture traces of time and expressions of these old buildings, our artists have walked into each building to taste their beauty, think of their history, listen to their stories and ultimately created their works of art in their own painting style. t the welcoming of 2010 Shanghai World Expo, the display of 50 watercolor paintings in The former residence of Huang Xing artistically witnesses a significant conversation with the city's Historical Architectural, which will surely be a precious historical memory to Shanghai.